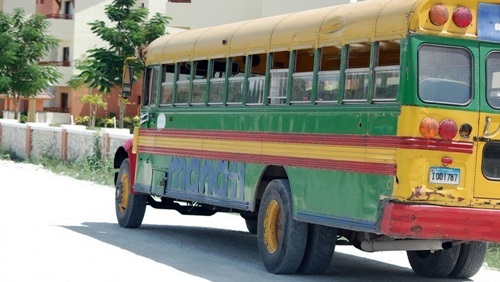 In the Dominican Republic buses are known as Guaguas. They are fairly cheap alternative for getting around Punta Cana and the rest of the Dominican Republic. Local buses cost RD$35 per ride and travel throughout Punta Cana with all ultimate destinations ending in Higuey. The bus system is reasonably safe and efficient. Most likely if you stay at the resort the staff there will discourage you from taking local buses. However riding around Punta Cana on local buses is quite safe and of course a lot cheaper than taking a hotel taxi. Each short trip will cost something like RD$35. If you decide to go to Higuey you will spend around RD$100. It is not completely simple to figure out the system but PuntaCanaBavaro site PuntaCanaBavaro.com has a very good bus guide. There are also number of long distance buses travelling around the Dominican Republic. The trip between Punta Cana and Santo Domingo is best do with company called Expreso Bavaro. The price for the trip is $375RD pesos (or roughly $10 USD). As of August 2012 the first bus leaves at 7am and then every two hours till 2pm in both directions. Expreso Bavaro operates 7 days a week. Buses leave from towns of Friusa (on the Avenida Estados Unidos) or Veron (on Carretera Luperon-Punta Cana). Buses leave Santo Domingo from Avenida Maximo Gomez on Juan Sanchez Ramirez #31 or on the edge of the city at El Parque Enriquillo on Avenida Duarte.